We ended our 2016 by celebrating with relaxation and fancy tummy satisfaction. 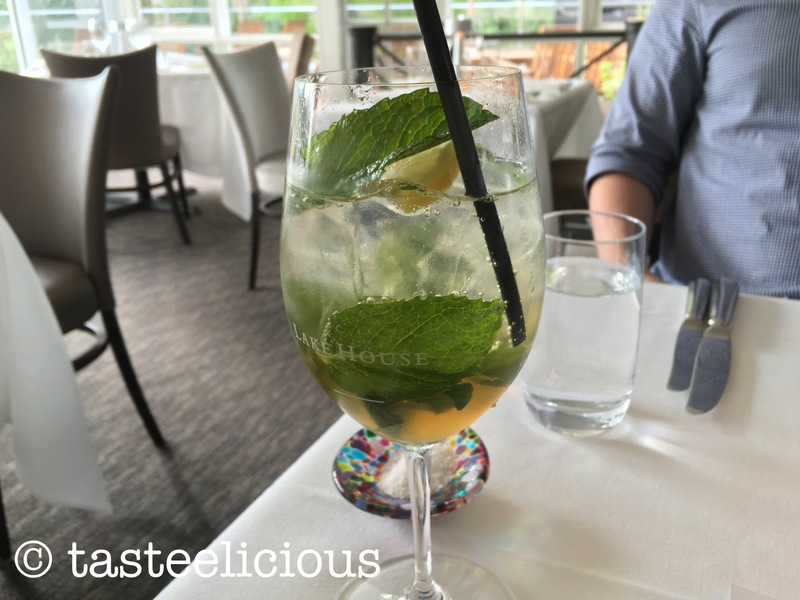 We were recommended two restaurants to try in Daylesford.. and we tried Lake house – 2 hatted chef restaurant. Lake house is not only a restaurant but it is a luxury hotel, spa and cooking school! Overlooking the lake with a beautiful view of nature. It’s just serene when dining with a view. It gives you the outback Australian vibe, tranquil because there’s a few antique shops around Daylesford. Their menus change regularly because they source from seasonal produce and ingredients regionally. 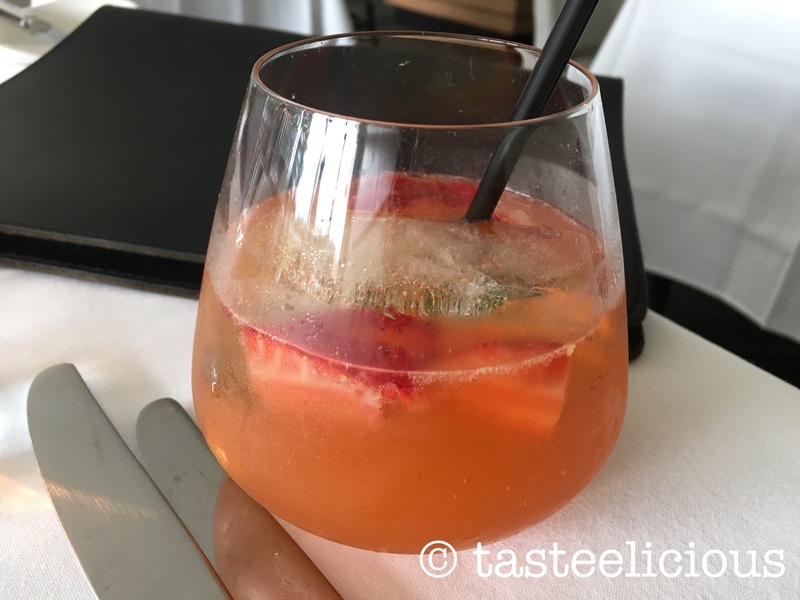 We started our fine dining with two refreshing mocktails; I’ve forgotten their names but they were perfect for a hot summer’s day. The mint leaves with ginger soda was a palette cleanser for each dish. We didn’t do the tasting menu but it still came with its perks. We were offered with complimentary starters and freshly baked sour dough with beautiful soft housemade butter. Starter was gently warmed with truffle sprinkled on top. Sorry I cannot be anymore detailed as there was no name for this! The Bread’s outer was crusty and fluffy in the inside. They used local Powlett Hill biodynamic spelt flour. I knew I was going to have quite a bit of food, so I held off from going for seconds! If you can fit it in, ask for more! Our first were from local waterways: Murray Cod, Trout, smoked eel, fennel and watercress and Sher Wagyu – Bresaola and tartare, House pickles. If you like a light entree to start, I’d recommend this light dish below. The only flaw is that the trout may be slightly fishy for my tasting. If you want a punch of flavour, definitely go for the Sher Wagyu, packed with flavour of the meat and pickles – faultless. My second was smoked quail. They served it with the quail still resting on a small bed of straws separated with the main dish that had the mushrooms. Sauce also aside. As they brought it to the table, they smoked it and swirled the aroma in front of me as they placed the quail just sitting on the main dish. Lastly drizzled the clear sauce around the quail. It was an entertainment within itself! Loved it. The quail was just right, the smokiness was only overpowering when they swirled it in front of my face, but it when tasted, it was perfect and warm. The Pork belly was what J had it was soft and not as fatty as other pork belly’s we’ve tasted. Unfortunately the skin was not crispy as we usually want with a crackle. But it had it’s own taste. There was a spray of foam next to the beans where I didn’t know what it adds to the dish. The beans were nice and fresh. Comparing the pork belly with the quail, I felt like it looked a bit dull that night. We also had the complimentary side salad below. Dressing was perfect. I don’t know what it was but most likely housemade again. The sides we chose were thrice cooked potatoes and roasted veggies with sour cream. Potatoes were flawless, it doesn’t look fancy but it was wonderful for me – i just needed to watch how much I eat as I still had dessert to go! The roasted veggies were beautiful! I’ve previously had squash but it had a bitter aftertaste. This was nothing like that. Perfectly cooked and J loved every bit of this side. Finally comes dessert and I picked black sesame below with white chocolate and lemon filling. 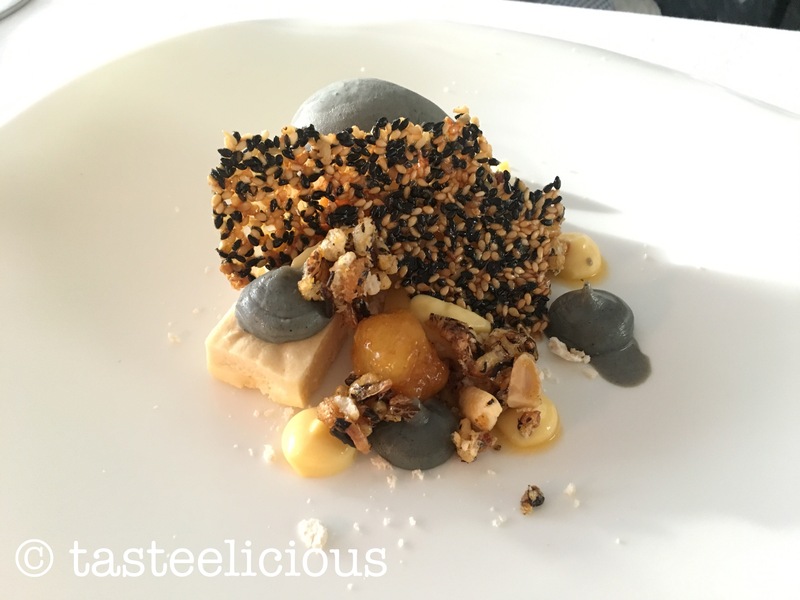 I found that this was my favourite dessert because it is hard to assemble and the flavours were more to my pallet. For those who don’t know I look for sour desserts with some sweetness. And the sweetness was the white chocolate here. The strings of lemon skin (i think) were not sour at all but adds texture to complete the dish. I reckon it was soaked with syrup. This one is for those who wants dessert but doesn’t want too sweet! We also picked the peanut butter, black sesame, caramel, banana, this is great for those peanut butter lovers as the block on the bottom is backed with their own peanut butter creation! 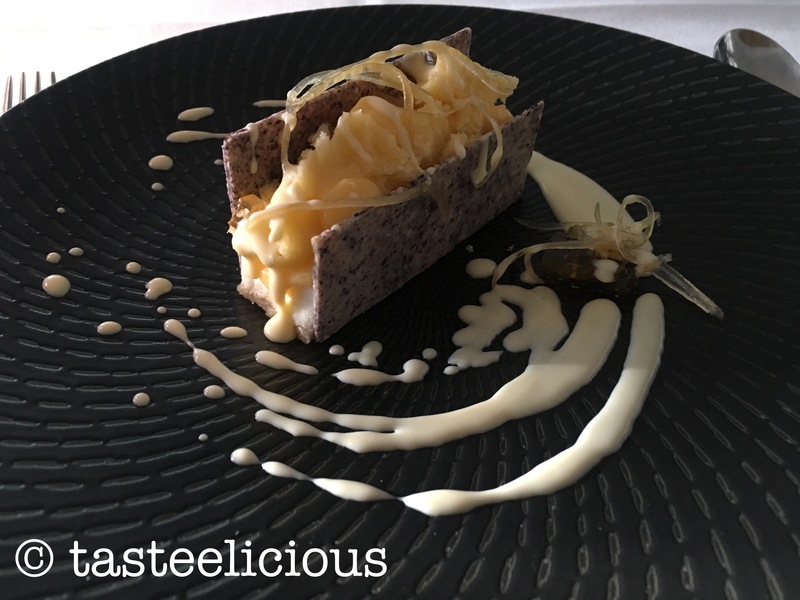 The black sesame ice cream was light in flavour which was needed to balance the strength of the peanut. The lemon dollops adds the acidity to the dessert. Perfect. Lastly the waiter brought out a plate of sweet indulgence selections in front of us to choose four. 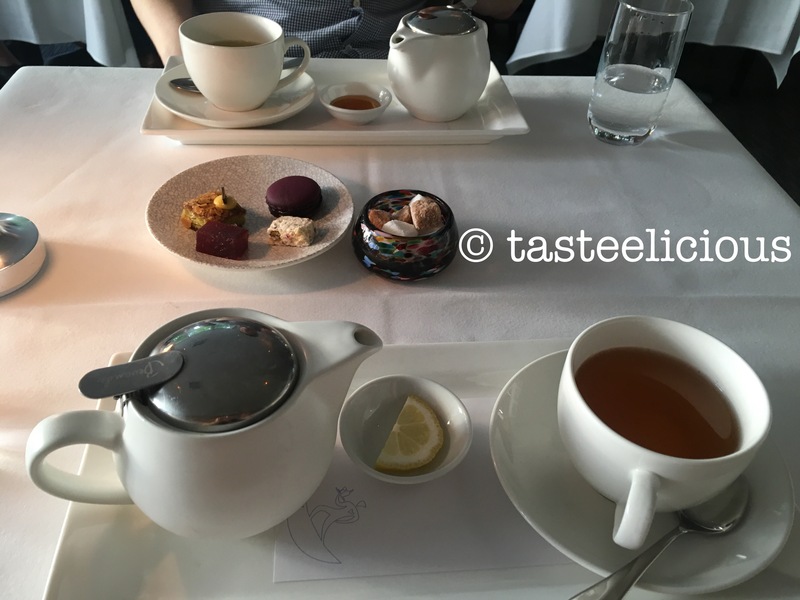 So we finished with the said choice of sweet indulgence and tea to relax for the rest of the night. These sweets were great! But I wouldn’t select the blackcurrant jelly-like again. I feel that is pretty easy to make. Overall, I’d recommend the splurge for a special celebration with your loved ones or friends. Service was great. Attentive, sufficient for each section, view was amazing (would open and close the blinds when is too bright for the sun to come through to the restaurant). Able to walk around the restaurant and lake in between courses. One thing we regret not doing is the “Dine and Unwind” package, where you can be indulged over lunch and relax at their spa! It would be the perfect anniversary celebration gift! Remember to book if you’re going on a holiday season as I found it busy difficult to book a spa last minute!